She was just a few paces past 40 when she stared down widow-hood like a looming spectral in the night. Her husband, also in his early forties, ran regularly at a local track. One day, with no prior health issues, he suddenly collapsed. Another runner raced to his side and performed CPR until emergency personnel arrived. Defibrillator paddles shocked his heart back from the brink; but life was touch-and-go for days afterwards. With tears streaming from soul-deep, and trying to comfort two small children, she proclaimed her trust in God and her unwavering faith in His goodness. 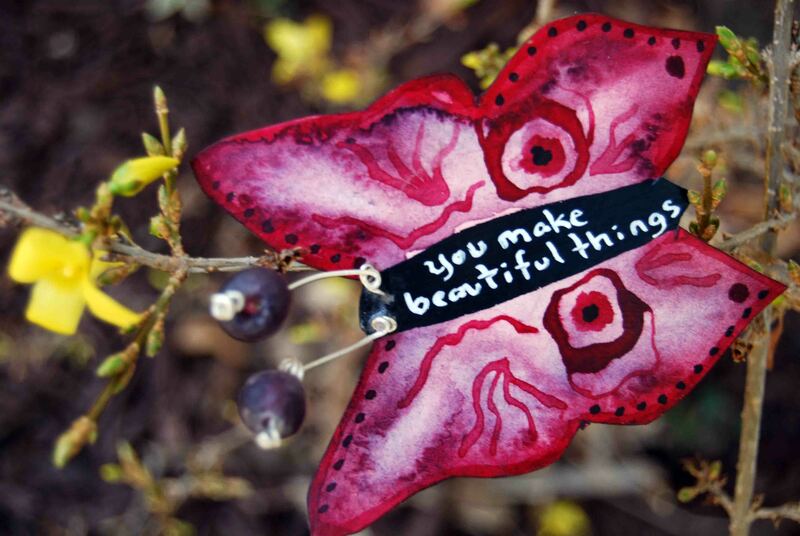 I made this mobile for her for her birthday last week, inspired by the lyrics of a song we both love called Beautiful Things by Gungor. It is my humble attempt to honor the pain and struggle of her journey, my admiration for her “faith of greater worth than gold” (1 Peter 1:7), and my own faith that, yes, God makes beautiful things. I know He does, because I see it in her. Witnessing faith in another person’s life is always a gift; but when that faith sings through the dark watches of the valley of the shadow of death, now that is hauntingly beautiful. THanks for visiting my blog! I love the positivity and celebratory tone of yours! Wow! Her faith is definitely inspiring, and I absolutely LOVE the vibrant butterflies and the way they communicate hope and truth! I feel very blessed to know this person since we were four years old! I thank God for her. ah, a comment from you is always a gift! Thank you Tony! Beautiful mobile! Love the way the artwork celebrates the beauty of God’s creation.